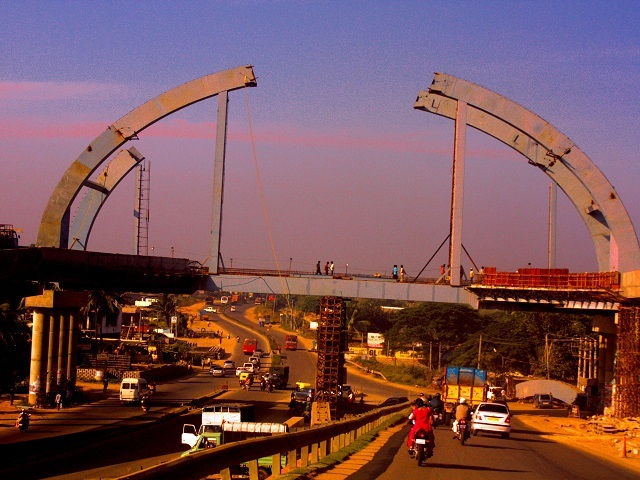 Metro station construction in Mysore, India. The transport sector has a major impact on the economic and environmental outlook for cities in both developed and developing countries. Photo by Samuel Raj/Flickr. Cropped. How much money is spent on global transport systems? And where is this money coming from? These are critical questions: The world’s cities will add 274,000 people every day for the next 30 years, and urban leaders are currently grappling with how to invest in solutions that will allow this growing population to safely live, commute, and carry out their livelihoods. This requires significant investment from governments and business in transport networks. Yet global public and private transport investments have never been comprehensively calculated—until now. New analysis from the World Resources Institute’s (WRI) EMBARQ and Climate programs quantifies the total annual transport capital investment around the world. Drawing on data from the Organisation for Economic Cooperation and Development (OECD), International Monetary Fund (IMF), World Bank, and others, The Trillion Dollar Question finds that the global transport investment is between US$1.4 and US$2.1 trillion each year, enough to fund the capital budget of New York’s subway 88 times. That figure is also somewhere between the GDP of Mexico and the United Kingdom. Any way you look at it, the amount is enormous. The majority of this investment comes from the private sector and goes to major economies like the United States and Japan. These findings have significant implications—both for the cities of today and for investing in the future cities we want. It’s well documented that the transport sector has a major impact on the economic and environmental outlook for cities in both the developed and developing worlds. Investments in transport infrastructure are particularly influential, as the roads, rails, and stations we build today will stick around for decades. More importantly, these capital investments will dictate long-term urban development and resource consumption patterns. For example, if present infrastructure and economic growth rates continue, China alone will boast more cars in 2050 than there are in the entire world today. This car explosion would generate more air pollution, fuel climate change, and pose safety concerns for both drivers and pedestrians. To reverse this car-centric trend, we need to change the kinds of transport assets we finance. The first step toward influencing global transport development is to follow the money and identify how to get finance flowing in the right directions. On that front, WRI research offers some early insights—particularly on the role of the private sector. WRI research finds that the private sector is a major player in global transport finance. While public investment accounts for US$569 to US$905 billion a year, the private sector directs between $814 billion and $1.2 trillion. Three-quarters of this investment occurs in high-income countries. The private sector’s larger role in transport investment is also more pronounced in wealthier countries, where the investment climate is more favorable (i.e. less risky). About 62 percent of investment in high-income countries comes from private sources, compared with about 44 percent in low- and middle-income countries. Investments from within the European Union, United States, and Japan account for 80 percent of total global private investment. Public finance comes almost exclusively from domestic budgets (98 percent), with the rest from international aid (about $14 billion) and climate funds (fewer than $2 billion). Estimated Private Investment in Transport by Site of Investment. Graph by EMBARQ. However, private investment in emerging economies’ transport networks may not be modest for much longer. World Bank data reveals that private participation in transport in low- and middle-income countries grew 400 percent between 2000 and 2012, suggesting that the opportunities for return on investment in transport in the developing world are viewed more positively than in the past. As the world’s massive urbanization continues, there are high expectations and big opportunities for the ongoing role of private enterprise in the transport sector—in both developed and developing nations. This week, for example, the Transforming Transportation 2014 (#TTDC14) conference, co-organized by EMBARQ and the World Bank, will focus on the theme of “Better Cities, Better Business.” Mayors, business leaders, and transport experts from around the world will convene to examine opportunities for the private sector to advance the sustainable urban mobility agenda for cities. While identifying the amount invested in transport overall is an important starting point, quantifying the volume of investment in sustainable transport—such as public transit, bicycle lanes, and pedestrian walkways— is a crucial next step. Currently, investment in developing countries favors carbon-intensive transport, putting these countries on the path toward unsustainable, auto-centric development already embedded in many parts of the developed world. Roughly 80 percent of the Asian Development Bank’s transport portfolio and the majority of private investment across all sectors in developing countries support roads and highways rather than sustainable transport systems. In order to catalyze investment in sustainable transport modes that reduce human impact on the environment and improve quality of life in cities, we need more detail. Tracking investment flows from public and private sources provides a springboard from which to track to investments in sustainable transport specifically. More importantly, it lays the foundation for developing strategies to increase investments in transport infrastructure that serves people, not cars. To learn more download the full working paper. 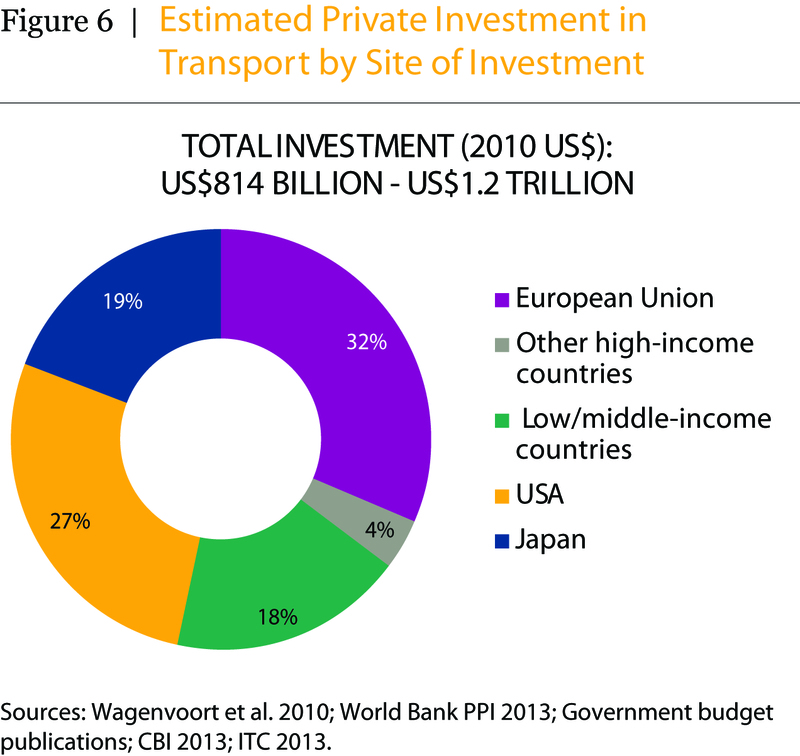 What does public and private sector investment in transport look like?